ammoon wireless guitar system(transmitter + receiver) with unique appearance design, is inspired by a Vintage Cherry Guitar. Features 10Hz-22KHz wide frequency response, 24bit/ 48KHz uncompressed signal transmission, it is available for most electric musical instruments, such as electric guitars, bass, electric-acoustic guitars, etc. Plug and Play, without connection trouble of long cables. With our ammoon wireless guitar system, you can enjoy your guitar tone in amazing and excellent details on your guitar amplifier anytime anywhere. 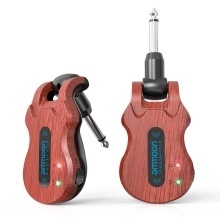 Wireless guitar system supports uncompressed signal transmitting and more than 300 feet outdoor transmission range; plug and play, no need of connection cable, flexible and convenient to use. Superior 110dB dynamic range, 24-bit/48KHz high-quality audio broadcasting, and 10Hz-22kHz full frequency response for more stable and more clear signal transmission. Built-in rechargeable lithium battery, working time is up to 5 hours after fully charged, and comes with a USB cable for convenient recharging, which ensures good performance for your every show. 220° rotatable plug design, available for most electric guitars, bass, electric-acoustic guitars, even suitable for stratocaster style guitars with vibrato system.